This page will have a focus on 2013-2015 plushes, likely from GE Entertainment, Nanco Nancy. With plushes showing up at offline retail such as FYE stores and online at more places like Amazon & Target, (and Toys R US too) plush availability seems to be on the rise. 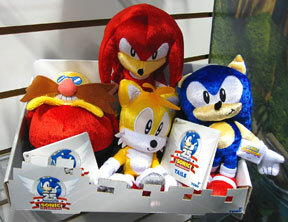 Sonic Boom plushes will NOT appear here, as they have their own seperate page. GE Entertainment is really on a roll in 2015! 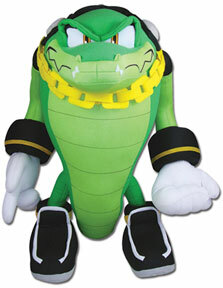 In the fall, they announced, with this factory photo, a Vector the Crocodile plush! 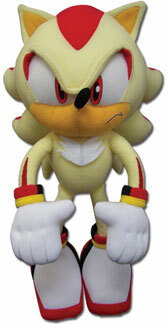 He's super news for fans of the Chaotix...and also likely means that a Charmy Bee would be on the way. The plush looks great too, they've got his signature chain necklace, headphones, unusual/thick glove cuffs, and even his teeth. They've posed his hands, and paid attention to his shoe detail. Great Eastern is making a Blaze the Cat plush. This is their factory photo (which they have managed to wash out a bit, wiping the whites from the gloves into the background and obscuring its detail) which looks pretty decent so far. The details all appearin place like her hair tips, head jewel, eyelashes, furry glove/boot cuffs, ponytail cuff necklace & coat-tail shirt. The eye color parts do not look. stuck down to the eye surface? The expression is decent, & the proportions look good. This will appear on Ebay & is pre ordering on some Amazon sellers. Fan photos will show better detail (like her tail) & what they decide upon with the eyes. Hopefully her expression is more game-accurate on the final doll. Photo discovered by Lightening. 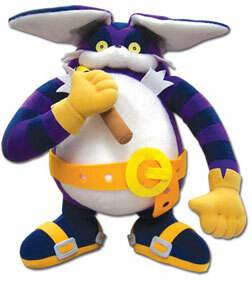 GE Animation's Big the Cat plush! He's pretty big too, at 15 inches. AND he's big on detail! Look at how the lower face part/mouth area is sculpted in there, they didn't just draw a line on his face, they actually bothered to put that part together. He has his fishing rod (bent in this photo) & the buckles on the backs of his shoes. The ears are shown flopped forward (do they stand up normally? A fan-photo may reveal the detail) How is the tail? His gloves/fingers are also nicely textured. GE Completes the Babylon Rogues! In winter 2015 / 2016 they'll add both Storm the Albatross and Wave the Swallow to finish the Babylon set. These factory photos look good so far...to a limited by the photography degree. Storm is supposed to be gray, but he looks a little purple/blue tinted? It's also impossible to tell how many fingers they have due to the angle of the hands. The beaks (being bright yellow) are suffering from a bit of wash-out, making the shape hard to determine. This photo is from Toy Fair Germany 2016, and shows Tomy is making classic styles plushes for the 25th Anniversary. The plushes are made from a new fabric, which has a different texture you can see here. It's sort of 'velvety' with a texture and a bit of shiny-ness to it. 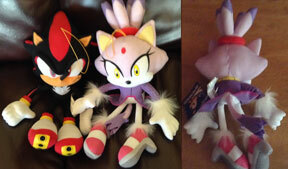 That's an interesting change and the plushes look decent with the vibrant color. The structure of them looks pretty good as well, Tails is cute, Sonic's head seems properly shaped (as does Knuckles) and Eggman is probably also ok. (His collar seems to be going a bit wrong, and you can't see the arms so it's impossible to judge completely here) Notice the display box too, it has that white pixel-edge perforated style they will likely use in combination with their 25th Anniversary other items. This time with a villian! 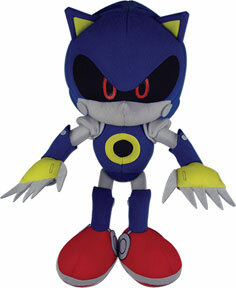 It's classic Metal Sonic plush. And, wow, they are really giving Tomy what-for on quality. This actually looks like the classic Metal Sonic, save for 1 forgotten detail. (The white stripe around the bottom edge of each shoe is missing) Robots rarely translate well into plush because of all the rounded edges/stuffiness of plush, but this is making an effort. The 'belly dot' engine is indented, they left the fingers as flat pointy felts (as it should be) the bolt details for face edge, elbow, shoe swivel & knee are all present. Then, look how they did the shoulder cuffs, they're actually 3D set in place. The ears are yellow & appropriatly small. The eye style is good as well, the reds are right & thin/well shaped too. By layering the shins/fore-arms it really adds good detail. The nose isn't missing. This factory photo has it from extat-right-ahead making it difficult to see, but it is a pointy cone. Here's a special exclusive for 2016! At the SanDiego Comic Con, Sanrio & Sega announced that Sonic would do a partnership with Hello Kitty to make this year's exclusive toy. 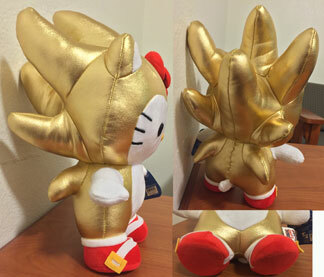 It's a Hello Kitty plush that's dressed up in a cute little Super Sonic suit. 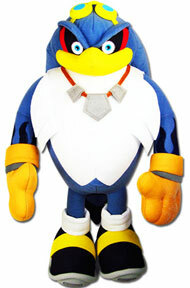 Hello has dressed up as Sonic before (but that's a Japan Plush) as regular Sonic. Notice the turned up spikes & classic shoes. She keeps her red bow, but even her ears have the gold border. To make it extra special, they chose a gold fabric that's actually smooth and shiny/metallic. 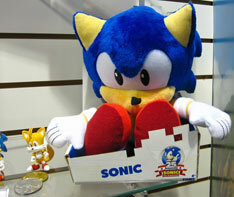 It's a bit of an unusual exclusive...because it's a Sonic themed item, rather than a directly Sonic item. Notice the cloth side tag has the collaberation logos on it as well. Over all, it looks quality (they actually changed the spikes, it's not just a re-color re-release) with fun shiny fabric & good detail. This was limited to 1000 pieces and cost $40 while only being sold there. Gold shiny fabric like this can sometimes suffer from "Gold Fabric Age Dulling", as can similarly shiny silver fabric. Humidity /air condition may play a part in how the fabric retains the shine as it ages. Wear also affects it. If it's moved/twisted/wrinkled repeatedly, it can lose shine. It's important to keep this plush quite safe and in a dry controlled environment.